Qatar is one of the key emerging countries in the Middle East region. Growth in Qatar UPS market is buoyed by several factors such as rising number of SMEs, growing IT spending and increasing acceptance of UPS systems among emerging number of data centers across the country. Commercial application is the major consumer of UPS systems followed by Industrial application. With the growing investment in Information & Communication Technology sector and government's vision "Qatar National Vision 2030" would drive the market for UPS systems during 2018-24. Qatar's ICT industry is expected to grow at a CAGR of 10.2% during 2015-2019. The demand for UPS systems would grow in IT industry as continuous power is necessary in such facilities to prevent loss of data and maintain smooth business operations. 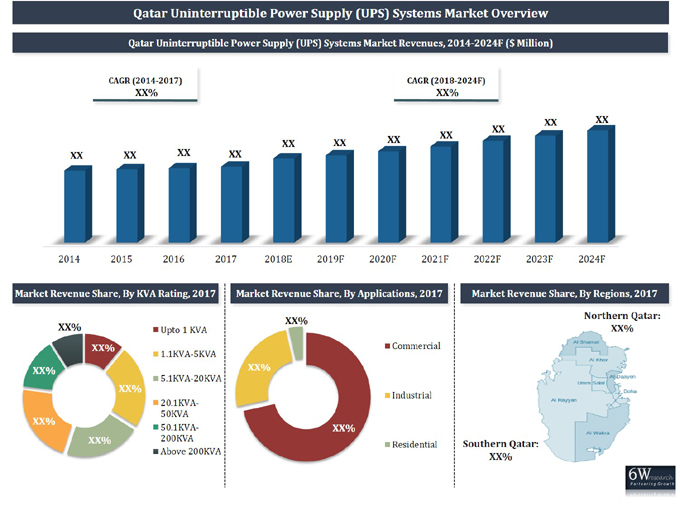 The report thoroughly covers the Qatar UPS systems market by KVA ratings, applications and regions. The report provides an unbiased and detailed analysis of the on-going trends, opportunities/high growth areas, market drivers which would help the stakeholders to device and align their market strategies according to the current and future market dynamics.